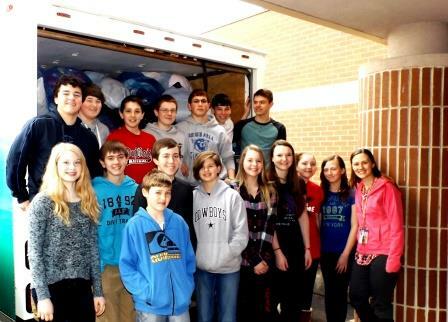 DUBOIS – The DuBois Middle School and Goodwill of North Central PA held a donation drive to celebrate the beginning of spring. The students and faculty collected 10,208 pounds of clothing to give to Goodwill from March 16-27. “We felt that a service learning project through Goodwill was a great way to get the student body and the community involved. Participating in the drive is easy. We planned this project specifically around the beginning of spring because we knew a lot of people, just like ourselves, are doing spring cleaning,” said Principal Wendy Benton. The donation drive was chosen by the Good to Great Committee as a service learning project. The committee, made up of middle school teachers, focuses on continuous school improvement and looks for incentives for students to do their best. With the help of the National Junior Honor Society, they decided to make this project a school-wide competition. “The students accepted a leadership role with this project and helped to collect the donations daily. Every morning members of National Junior Honor Society collected the donations, delivered them to the weighing station and tracked the progress. An announcement was made at the end of every day to share the progress of each team and to identify the top three teams”, said Benton. During the last few days, the competition came down to a battle between two, eighth grade teams. The winning team, Team I, raised 2,263 pounds of donations and Team H came in a close second with 2,201 pounds. The winning team will get a pizza party and both will be presented with an award from Goodwill of North Central PA.
Once the donation drive is over, Goodwill makes a financial donation to the school. Schools use that donation to fund special projects or events that they may not have funding for otherwise. “All of the proceeds from the Goodwill Donation Drive will go back to our students. The Good to Great committee will decide what kind of prizes and incentives are really going to motivate students to achieve. We want every student to be the greatest that he or she can be.” said Benton. Rumble in the jungle: can wild animals help us predict earthquakes?